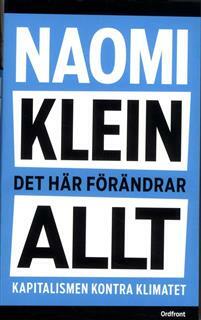 In Sweden we got an election coming up within two weeks. For us wha care about the environment it is a interesting election because it is a lot of focus of the topic environment. But hand to heart, how much do we all care from a bigger perspective? We as abassadoers for the nature, do we really live as we learn. Maybe we should consider our own impression on the nature travel to our adventures..Do we live as minimalistic as we can. It might be time to find adventures in our own country, there is a lot to explore in Sweden ans Norway and it is accessable with train for example. 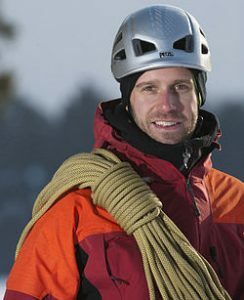 With this topic in my mind I decided to discuss it with two well knowned personalities from Sweden, Ola Skinnarmo adventurer and Fredrik Sträng climber. Sweden and Norway is fantastic, and it can be a climate-savvy choise. 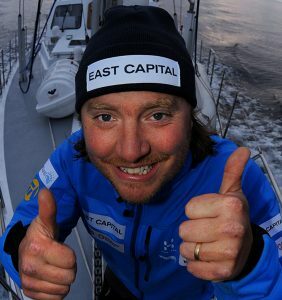 Ola Skinnarmo about the environment..
Hello Ola, what are you up to now? I have just returned from a guiding tour of Kilimanjaro, and soon I go to Svalbard with a new group. So that’s a lot going on. How do you see trips and adventures linked to the fact that there is great focus and discussion about the environment right now? -I think it is commendable to think of adventures in our vicinity, Sweden and Norway by train, for example. Clearly, the journeys we make by air are influenced, and it is important to consider climate compensation. Which, of course, I do. When it comes to trips to Svalbard, it’s very important for me to be its ambassador, to understand its potential. Flight affects a lot, but our everyday life affects more than ever. There we can do more everyone of us. Introducing our election in Sweden in brief, how do you think we should think about it from an environmental perspective? 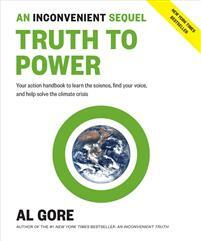 ”I think all our politicians have a strange view of this with environmental politics. We have now had a government with the environmental party in charge for four years, and I find it hard to see that we have reached major climate gains. It has become cheaper to buy electric bikes, with a mountain of lithium batteries as a result in a couple of years. Maybe there would have been a price deduction on regular bikes instead? The environmental issue is an important topic, and I feel today that nobody grabs in a sensible way. How do you intend to be an adventurer in terms of environment? -First and foremost, I’m not an adventurer, I’m a climber. I can hold a long lecture about that distinction, but it’s about being athlete, measuring and comparing performance, etc. It’s a scientific thought behind it all. To primarily measure against others, to find new ways / solutions. Do not compete, but to improve and to develop. The secondary will then be to do something unique. Ok, but as a climber then how are you thinking about the environment? ”I have chosen environmentally friendly electricity in my accommodation, I always compensate for my travels. I also ask for where this money goes. Solar and renewable energy in the third world is an example. I eat organic and controlled food. Choosing organic products, I do not eat very much meat. Vegetarian food and fair products. I also give away equipment I do not need for better needy (such as Sherpas and carrier). I also place demands on my partners. As soon as I have the opportunity, I cycle, and then not on a electic bike that I think is pathetic. Basically, it is a matter of taking responsibility. To think ”minimalist” and to have civil courage to take the debate. But it is not always that easy, or? We are facing a election in Sweden, how do you look at Swedish environmental politics before the election? -The day’s environmental politics is very short-term rather than assuming the big perspective. We run what I call McDonald’s policy. I will not point out what is best to vote for in future elections, that it is up to everyone. But as I said before, the more we are taking citizenship responsibility, and who learn more and understand where we are heading. Our choices in practice as well as rhetoric will be decisive for the future of our planet. So the conclusion for us nature lovers, the upcoming election is a breaze just passing by, we need to do something more. maybe this can be a step to look into..But why dont start with the suggested books..
Upcoming week there will be a evaluation of a new brand; Tecnique Extreme. Based in Chamonix, I got high expectations..and of course a new interview.. So, then I was back to the everyday Life again. But this fall I will try to do things a little different. First of all the Tuesdays will be special. I hav edecided those Days to be ”trying” days. So every Tuesday I will try something new. Last tyesday I tried a new brand of champagne, like that Tuesday for sure. Erik Hellberg Meschaks at the Environmental Pretection Agency. Hi Erik, when it comes to the trails in the Swedish Mountains, can you see if the tourism is increasing? -Well, it is difficult to statistically ensure an increase, but if you look at the visitor statistics overall, we can see an increase. We can also see that in certain specific areas it increases. Kebnekaise, Vålådalen Western Jämtlandsfjällen are some clear examples. We can also see that the day-visit trend is increasing significantly. There, the Blanktjärns ring in Vålådalen is a good example, where visits increased from 2-3000 up to 16000. Can you see increased wear on the joints associated with increased occupancy and cycling more today? 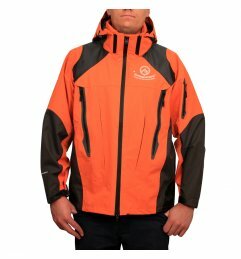 -Yes, there are areas that are more sensitive and where the wear is more pronounced. In the case of bicycles, the challenge of getting the trailsolutions(Sv. spänger) that cyclists can use do not forget the runners that have become a common feature in the mountains. The increase of runners is more pronounced in Jämtland than in Norrbotten. In terms of wear, terrain vehicles and snowmobiles are a much bigger problem. With less snowy winters, the mountain environment is more affected, taking less account of the fact that areas are prohibited for snowmobiling. An investigation is ongoing. How does the distribution of funds for maintenance of the trails look? Is there as more to Norrbotten as to Jämtland? -We currently have 17.5 million / year to maintain our mountain ranges. Of course, we take into account the amount of visitors in the areas. There comes Jämtland to the top. But it has been pushed for funds so it will be almost 30million / year. Of these extra money, much has gone to Norrbotten. This because you have more and bigger bridges scroll. Which requires more money for maintenance. When it comes to Kebnekaise and its highest peak, how will the Swedish Environmental Protection Agency handle that challenge? -Today we have a very clear division of responsibility. We own responsibility for the Western route, and STF for the Eastern route. To get to the Northern peak, another road will be a demand. Norway has a similar challenge with Glittertind and Galdhöpiggen. From our point of view, the mission of the government is very clear; We will be responsible for the safety of the long-trail of the Swedish mountain trails. But of course, we are most involved in the discussions about Kebnekaise and its peaks together with the STF, the Mountain Safety Council, etc. When it comes to new gear, this week I will present a new beer at the market. The workout follows the plan, at the moment there will be focus at the cardiovascular parts.. 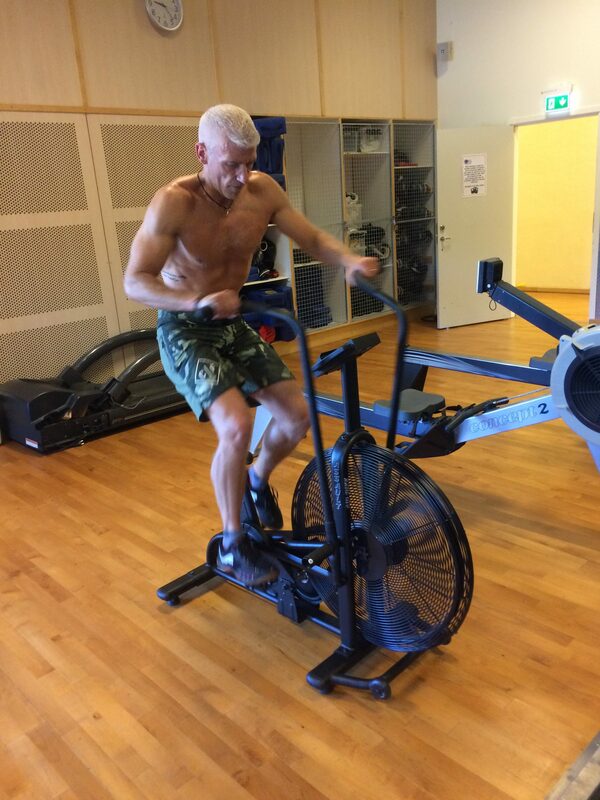 The killer; the air assault bike…for cardiovasular workout at its best..
And this weeks music Barns Courtney..enjoy..And Goran, Micke and Inge ”Break a leg”. A interview, nice glasses and a event.. This week we start something new, interviews with people conected to current events in the outdoor World. 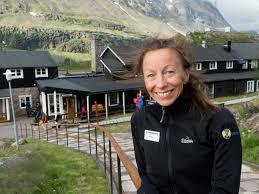 Today we start with Marit Sarri, the manager at Kebnekaise mountain lodge. Marit Sarri Manager of the Kebnekasie mountain lodge. -Hi Marit, today we got a new ”roof of Sweden. The northern peak of Kebnekaise has become the highest peak in Sweden. Can you see that the Tourists asking for going to the new top peak, and are you ready for that? -Well, as we can se today people are not so interested of visit the northern peak. We can also see at the moment that the peaks will shift during seson wich one who will become the higest. Of the Tourist that today reach the southpeak, about 90% are satifyied with that. If you want to go the northern peak we can offer you that service with a mountain guide. But as I said, we can’t se any great need of that at the moment. -Have you have had any discussion with the Environmental Protection Agency(Sv. 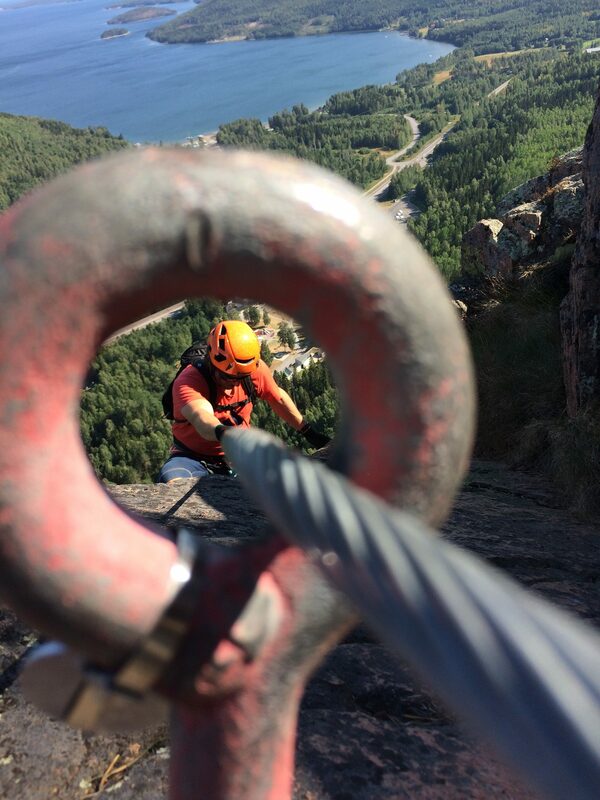 Naturvårdsverket) about any fieldwork for safety and to easy up the ascending of the peak? -We know that some places in the European alps got the same challenge in same places and we looking into that for getting ideas of what can be done. 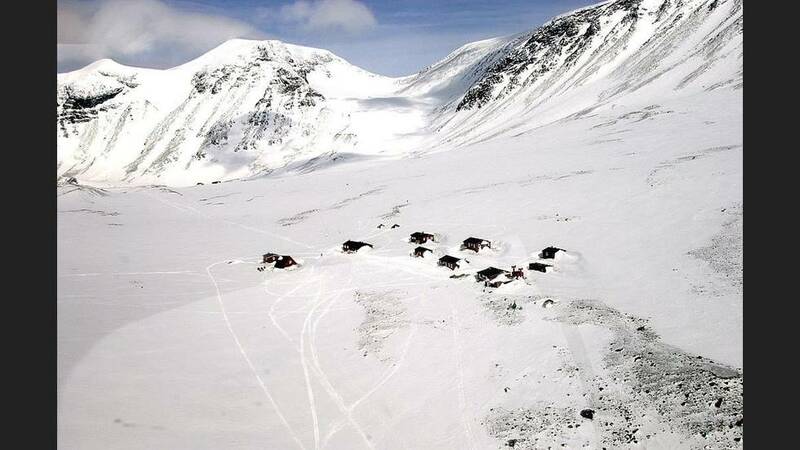 -Does Kebnekaise will be less important vs Tarfala mountain Lodge due to that the lodge is closer to the norhtern peak? 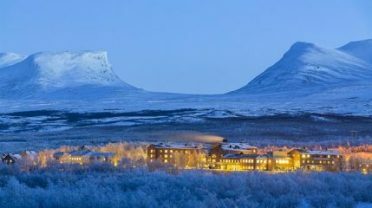 -No, that mountain lodge do not have that capacity, and you will be able to reach the peak from Kebnekaise mountain lodge either via the Ridge from the southpeak or Nygrens route. We also want to have the Tourist so see more of the whole area as well. The Tarfala valley etc. And as I said Before we already got the service with mountain guides so you can reach the both peaks. 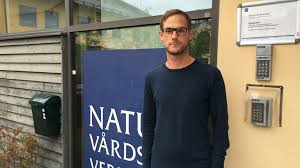 When it comes to new Products i will male a blow for Niklas Orginella. 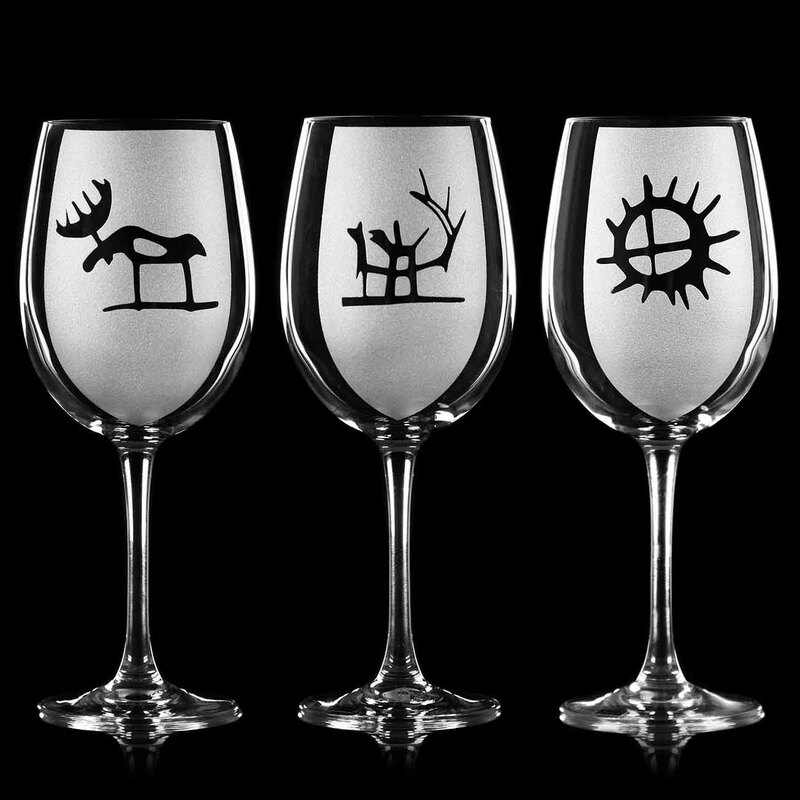 Niklas Eklund produce real nice glass art. 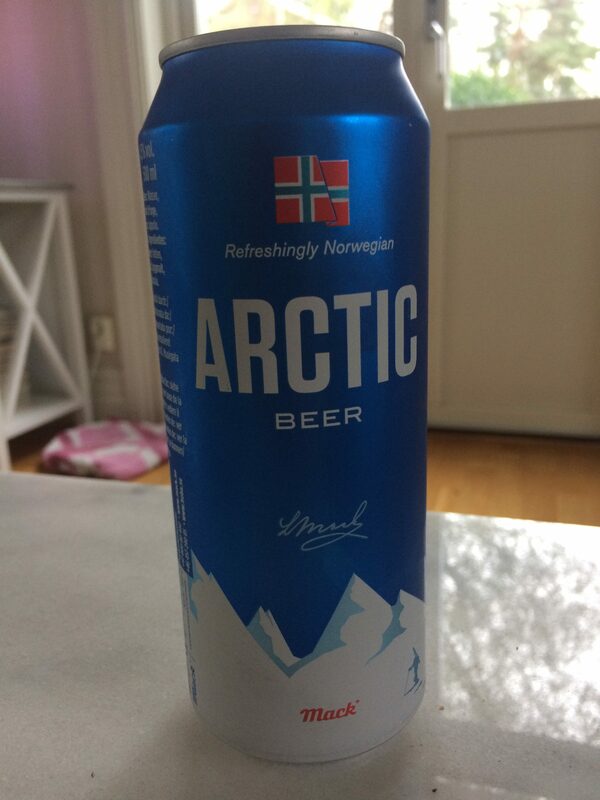 For us who is interested in the sami Culture we got something quite nice here..I can really recomend this products. So nice.. When it comes to events the outdoor feest at friluftsbyn in Docksta will be held the weekend of 7th-9th of September. Kayaking, Via Ferrata, Climbing, Trail running. so for you outdoor enthusiasts this is your weekend.. Vacation is over and a new blog.. So the vacation is over for this time. From now there will be a new blog every Sunday. But one news will be; it will be a interview with a person related to Mountains and outdoor activities. The first interview will be next Sunday. 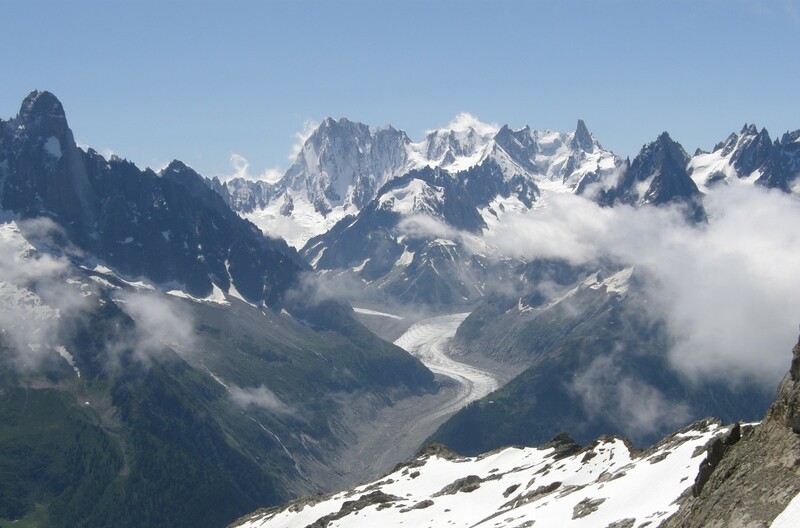 The summer has been hot, this means that the glaciers will be affected. one consequence of this is that its only differ 20cm between the two peaks. The scientist at Tarfala research station think there will only be Days Before the peaks got the same altitude. This will as i wright about Before, affect the tourism in the area. Tarfala mountain station, and Kebnekaise in the background.. When we still are in the area we can also inform that the mountain rescue has been doing rescue missions in the area. A women with her two kids was cought by bad weather and fog, so they could not navigate. So the Mountain rescue have to support them. When they found them there were about 40 person waiting out the fog.. When it comes to workout, there has been good progress. With a PR in bench-press and a lot of cardio-workout I am ready for the fall. Also some wall climbing to get the feeling and shaping up the tecnique..
Of course there has been a tour to Skuleberget for a Via Ferrata, and there is more to come. September and October is the best time for Via Ferrata..
And now over to some gear Review. Today I will look into aproach shoes. What I Think is important is that: 1. the shoe must be comfortable. 2. It must be stable. 3. It should be able to do some simple climbing with. 4. The price should not be over 200 Euro. 5. It must have good grip. (most important) Normally brands as Scarpa, La Sportiva, Millet, is mot common, but here we will look into Montura from Italy and Salewa with a background from Germany. This two shoes are very good. Both are very comfortable and got a really good grip. They are best for thin foots, and the sizes of them is ”normal” I got 42, and can have a normal socks in them. 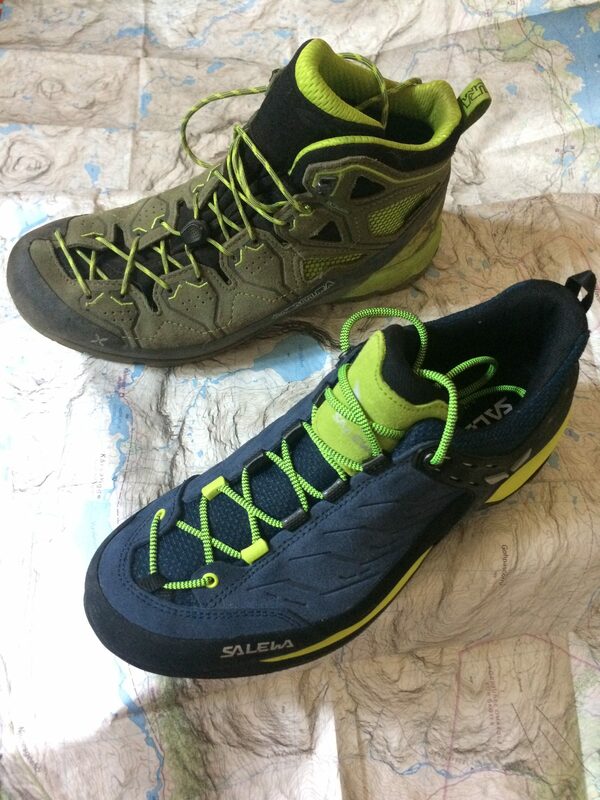 The Salewas MTN Trainer shoe will be my favourite used for the Via Ferrata. But both shoe will get 5 out of 5 NLA:s(Nordic Light Adventures stars) The Montura Yaru Tecno GTX is also very good for Via Ferrata and easy mountaineering or sky hikes in the alps..
See ya soon, and dont forget the interview next Sunday..